Emporio Armani glasses are part of Emporio Armani accessory collection. 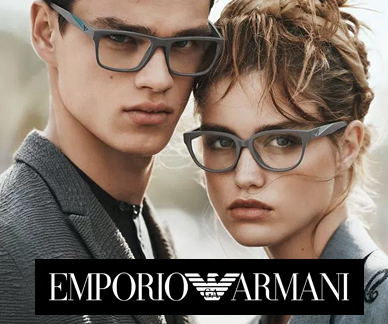 Emporio Armani is from the Armani family of brands that is geared towards young professionals. Casual styles with a touch of elegance make Emporio Armani eyeglasses perfectly suited to today's work environment. The brand is the response to the lifestyle and wardrobe style of majority of working people as suit and official clothing is getting replaced by jeans Polo shirts and causal dresses. Emporio Armani eyeglasses are made in the best traditions of Italian eyewear craftsmanship. Each pair is designed according to modern trends and hand crafted at the largest eyeglasses factory in the world. Add prescription lenses to your Emporio Armani glasses frames order when conveniently shopping online. All Emporio Armani glasses at EyeInform store are authentic and ship with original factory packaging. Buy Emporio Armani EA1088 glasses online at a friendly price. Originally made in 2019, Armani 1088 are lightweight metal frames. Each pair of authentic Emporio Armani glasses ships worldwide with authenticity certificate, Emporio Armani box, case and a cleaning cloth. Buy Emporio Armani EA1087 glasses online at a friendly price. Originally made in 2019, Armani 1087 are lightweight metal frames. Each pair of authentic Emporio Armani glasses ships worldwide with authenticity certificate, Emporio Armani box, case and a cleaning cloth. Buy Emporio Armani EA1086 glasses online at a friendly price. Originally made in 2019, Armani 1086 are lightweight metal frames. Each pair of authentic Emporio Armani glasses ships worldwide with authenticity certificate, Emporio Armani box, case and a cleaning cloth. Buy Emporio Armani EA3144F glasses online at a friendly price. Originally made in 2018, Armani 3144F are lightweight plastic frames. Each pair of authentic Emporio Armani glasses ships worldwide with authenticity certificate, Emporio Armani box, case and a cleaning cloth. Buy Emporio Armani EA3144 glasses online at a friendly price. Originally made in 2018, Armani 3144 are lightweight plastic frames. Each pair of authentic Emporio Armani glasses ships worldwide with authenticity certificate, Emporio Armani box, case and a cleaning cloth. Buy Emporio Armani EA3143F glasses online at a friendly price. Originally made in 2018, Armani 3143F are lightweight plastic frames. Each pair of authentic Emporio Armani glasses ships worldwide with authenticity certificate, Emporio Armani box, case and a cleaning cloth. Buy Emporio Armani EA3143 glasses online at a friendly price. Originally made in 2018, Armani 3143 are lightweight plastic frames. Each pair of authentic Emporio Armani glasses ships worldwide with authenticity certificate, Emporio Armani box, case and a cleaning cloth. Buy Emporio Armani EA3142F glasses online at a friendly price. Originally made in 2018, Armani 3142F are lightweight plastic frames. Each pair of authentic Emporio Armani glasses ships worldwide with authenticity certificate, Emporio Armani box, case and a cleaning cloth. Buy Emporio Armani EA3142 glasses online at a friendly price. Originally made in 2018, Armani 3142 are lightweight plastic frames. Each pair of authentic Emporio Armani glasses ships worldwide with authenticity certificate, Emporio Armani box, case and a cleaning cloth. Buy Emporio Armani EA3141F glasses online at a friendly price. Originally made in 2018, Armani 3141F are lightweight plastic frames. Each pair of authentic Emporio Armani glasses ships worldwide with authenticity certificate, Emporio Armani box, case and a cleaning cloth. Buy Emporio Armani EA3141 glasses online at a friendly price. Originally made in 2018, Armani 3141 are lightweight plastic frames. Each pair of authentic Emporio Armani glasses ships worldwide with authenticity certificate, Emporio Armani box, case and a cleaning cloth. Buy Emporio Armani EA3140F glasses online at a friendly price. Originally made in 2018, Armani 3140F are lightweight plastic frames. Each pair of authentic Emporio Armani glasses ships worldwide with authenticity certificate, Emporio Armani box, case and a cleaning cloth. Buy Emporio Armani EA3140 glasses online at a friendly price. Originally made in 2018, Armani 3140 are lightweight plastic frames. Each pair of authentic Emporio Armani glasses ships worldwide with authenticity certificate, Emporio Armani box, case and a cleaning cloth. Buy Emporio Armani EA3139F glasses online at a friendly price. Originally made in 2018, Armani 3139F are lightweight plastic frames. Each pair of authentic Emporio Armani glasses ships worldwide with authenticity certificate, Emporio Armani box, case and a cleaning cloth. Buy Emporio Armani EA3139 glasses online at a friendly price. Originally made in 2018, Armani 3139 are lightweight plastic frames. Each pair of authentic Emporio Armani glasses ships worldwide with authenticity certificate, Emporio Armani box, case and a cleaning cloth. Buy Emporio Armani EA1084 glasses online at a friendly price. Originally made in 2018, Armani 1084 are lightweight metal frames. Each pair of authentic Emporio Armani glasses ships worldwide with authenticity certificate, Emporio Armani box, case and a cleaning cloth. Buy Emporio Armani EA1083 glasses online at a friendly price. Originally made in 2018, Armani 1083 are lightweight metal frames. Each pair of authentic Emporio Armani glasses ships worldwide with authenticity certificate, Emporio Armani box, case and a cleaning cloth. Buy Emporio Armani EA1082 glasses online at a friendly price. Originally made in 2018, Armani 1082 are lightweight metal frames. Each pair of authentic Emporio Armani glasses ships worldwide with authenticity certificate, Emporio Armani box, case and a cleaning cloth. Buy Emporio Armani EA3138F glasses online at a friendly price. Originally made in 2018, Armani 3138F are lightweight plastic frames. Each pair of authentic Emporio Armani glasses ships worldwide with authenticity certificate, Emporio Armani box, case and a cleaning cloth. Buy Emporio Armani EA3138 glasses online at a friendly price. Originally made in 2018, Armani 3138 are lightweight plastic frames. Each pair of authentic Emporio Armani glasses ships worldwide with authenticity certificate, Emporio Armani box, case and a cleaning cloth. Buy Emporio Armani EA3137 glasses online at a friendly price. Originally made in 2018, Armani 3137 are lightweight plastic frames. Each pair of authentic Emporio Armani glasses ships worldwide with authenticity certificate, Emporio Armani box, case and a cleaning cloth. Buy Emporio Armani EA3136F glasses online at a friendly price. Originally made in 2018, Armani 3136F are lightweight plastic frames. Each pair of authentic Emporio Armani glasses ships worldwide with authenticity certificate, Emporio Armani box, case and a cleaning cloth. Buy Emporio Armani EA3136 glasses online at a friendly price. Originally made in 2018, Armani 3136 are lightweight plastic frames. Each pair of authentic Emporio Armani glasses ships worldwide with authenticity certificate, Emporio Armani box, case and a cleaning cloth. Buy Emporio Armani EA3135F glasses online at a friendly price. Originally made in 2018, Armani 3135F are lightweight plastic frames. Each pair of authentic Emporio Armani glasses ships worldwide with authenticity certificate, Emporio Armani box, case and a cleaning cloth. Buy Emporio Armani EA3135 glasses online at a friendly price. Originally made in 2018, Armani 3135 are lightweight plastic frames. Each pair of authentic Emporio Armani glasses ships worldwide with authenticity certificate, Emporio Armani box, case and a cleaning cloth. Buy Emporio Armani EA3128F glasses online at a friendly price. Originally made in 2018, Armani 3128F are lightweight plastic frames. Each pair of authentic Emporio Armani glasses ships worldwide with authenticity certificate, Emporio Armani box, case and a cleaning cloth. Buy Emporio Armani EA3128 glasses online at a friendly price. Originally made in 2018, Armani 3128 are lightweight plastic frames. Each pair of authentic Emporio Armani glasses ships worldwide with authenticity certificate, Emporio Armani box, case and a cleaning cloth. Buy Emporio Armani EA3103F glasses online at a friendly price. Originally made in 2018, Armani 3103F are lightweight plastic frames. Each pair of authentic Emporio Armani glasses ships worldwide with authenticity certificate, Emporio Armani box, case and a cleaning cloth. Buy Emporio Armani EA3099F glasses online at a friendly price. Originally made in 2018, Armani 3099F are lightweight plastic frames. Each pair of authentic Emporio Armani glasses ships worldwide with authenticity certificate, Emporio Armani box, case and a cleaning cloth. Buy Emporio Armani EA3098F glasses online at a friendly price. Originally made in 2018, Armani 3098F are lightweight plastic frames. Each pair of authentic Emporio Armani glasses ships worldwide with authenticity certificate, Emporio Armani box, case and a cleaning cloth. Buy Emporio Armani EA3097F glasses online at a friendly price. Originally made in 2018, Armani 3097F are lightweight plastic frames. Each pair of authentic Emporio Armani glasses ships worldwide with authenticity certificate, Emporio Armani box, case and a cleaning cloth. Buy Emporio Armani EA1081 glasses online at a friendly price. Originally made in 2018, Armani 1081 are lightweight metal frames. Each pair of authentic Emporio Armani glasses ships worldwide with authenticity certificate, Emporio Armani box, case and a cleaning cloth. Buy Emporio Armani EA1080 glasses online at a friendly price. Originally made in 2018, Armani 1080 are lightweight metal frames. Each pair of authentic Emporio Armani glasses ships worldwide with authenticity certificate, Emporio Armani box, case and a cleaning cloth. Buy Emporio Armani EA1079 glasses online at a friendly price. Originally made in 2018, Armani 1079 are lightweight metal frames. Each pair of authentic Emporio Armani glasses ships worldwide with authenticity certificate, Emporio Armani box, case and a cleaning cloth. Buy Emporio Armani EA1078 glasses online at a friendly price. Originally made in 2018, Armani 1078 are lightweight metal frames. Each pair of authentic Emporio Armani glasses ships worldwide with authenticity certificate, Emporio Armani box, case and a cleaning cloth. Buy Emporio Armani EA3133F glasses online at a friendly price. Originally made in 2018, Armani 3133F are lightweight plastic frames. Each pair of authentic Emporio Armani glasses ships worldwide with authenticity certificate, Emporio Armani box, case and a cleaning cloth. Buy Emporio Armani EA3133 glasses online at a friendly price. Originally made in 2018, Armani 3133 are lightweight plastic frames. Each pair of authentic Emporio Armani glasses ships worldwide with authenticity certificate, Emporio Armani box, case and a cleaning cloth. Buy Emporio Armani EA3132 glasses online at a friendly price. Originally made in 2018, Armani 3132 are lightweight plastic frames. Each pair of authentic Emporio Armani glasses ships worldwide with authenticity certificate, Emporio Armani box, case and a cleaning cloth. Buy Emporio Armani EA3131F glasses online at a friendly price. Originally made in 2018, Armani 3131F are lightweight plastic frames. Each pair of authentic Emporio Armani glasses ships worldwide with authenticity certificate, Emporio Armani box, case and a cleaning cloth. Buy Emporio Armani EA3131 glasses online at a friendly price. Originally made in 2018, Armani 3131 are lightweight plastic frames. Each pair of authentic Emporio Armani glasses ships worldwide with authenticity certificate, Emporio Armani box, case and a cleaning cloth. Buy Emporio Armani EA3130F glasses online at a friendly price. Originally made in 2018, Armani 3130F are lightweight plastic frames. Each pair of authentic Emporio Armani glasses ships worldwide with authenticity certificate, Emporio Armani box, case and a cleaning cloth. Buy Emporio Armani EA3130 glasses online at a friendly price. Originally made in 2018, Armani 3130 are lightweight plastic frames. Each pair of authentic Emporio Armani glasses ships worldwide with authenticity certificate, Emporio Armani box, case and a cleaning cloth. Buy Emporio Armani EA1076 glasses online at a friendly price. Originally made in 2018, Armani 1076 are lightweight metal frames. Each pair of authentic Emporio Armani glasses ships worldwide with authenticity certificate, Emporio Armani box, case and a cleaning cloth. Buy Emporio Armani EA1075 glasses online at a friendly price. Originally made in 2018, Armani 1075 are lightweight metal frames. Each pair of authentic Emporio Armani glasses ships worldwide with authenticity certificate, Emporio Armani box, case and a cleaning cloth. Buy Emporio Armani EA1074 glasses online at a friendly price. Originally made in 2018, Armani 1074 are lightweight metal frames. Each pair of authentic Emporio Armani glasses ships worldwide with authenticity certificate, Emporio Armani box, case and a cleaning cloth. Buy Emporio Armani EA1073 glasses online at a friendly price. Originally made in 2018, Armani 1073 are lightweight metal frames. Each pair of authentic Emporio Armani glasses ships worldwide with authenticity certificate, Emporio Armani box, case and a cleaning cloth. Buy Emporio Armani EA1072 glasses online at a friendly price. Originally made in 2018, Armani 1072 are lightweight metal frames. Each pair of authentic Emporio Armani glasses ships worldwide with authenticity certificate, Emporio Armani box, case and a cleaning cloth. Buy Emporio Armani EA3127F glasses online at a friendly price. Originally made in 2018, Armani 3127F are lightweight plastic frames. Each pair of authentic Emporio Armani glasses ships worldwide with authenticity certificate, Emporio Armani box, case and a cleaning cloth. Buy Emporio Armani EA3127 glasses online at a friendly price. Originally made in 2018, Armani 3127 are lightweight plastic frames. Each pair of authentic Emporio Armani glasses ships worldwide with authenticity certificate, Emporio Armani box, case and a cleaning cloth. Buy Emporio Armani EA3126F glasses online at a friendly price. Originally made in 2018, Armani 3126F are lightweight plastic frames. Each pair of authentic Emporio Armani glasses ships worldwide with authenticity certificate, Emporio Armani box, case and a cleaning cloth. Buy Emporio Armani EA3126 glasses online at a friendly price. Originally made in 2018, Armani 3126 are lightweight plastic frames. Each pair of authentic Emporio Armani glasses ships worldwide with authenticity certificate, Emporio Armani box, case and a cleaning cloth. Buy Emporio Armani EA3125F glasses online at a friendly price. Originally made in 2018, Armani 3125F are lightweight plastic frames. Each pair of authentic Emporio Armani glasses ships worldwide with authenticity certificate, Emporio Armani box, case and a cleaning cloth. Buy Emporio Armani EA3125 glasses online at a friendly price. Originally made in 2018, Armani 3125 are lightweight plastic frames. Each pair of authentic Emporio Armani glasses ships worldwide with authenticity certificate, Emporio Armani box, case and a cleaning cloth. Buy Emporio Armani EA3124F glasses online at a friendly price. Originally made in 2018, Armani 3124F are lightweight plastic frames. Each pair of authentic Emporio Armani glasses ships worldwide with authenticity certificate, Emporio Armani box, case and a cleaning cloth. Buy Emporio Armani EA3124 glasses online at a friendly price. Originally made in 2018, Armani 3124 are lightweight plastic frames. Each pair of authentic Emporio Armani glasses ships worldwide with authenticity certificate, Emporio Armani box, case and a cleaning cloth. Buy Emporio Armani EA1071 glasses online at a friendly price. Originally made in 2018, Armani 1071 are lightweight metal frames. Each pair of authentic Emporio Armani glasses ships worldwide with authenticity certificate, Emporio Armani box, case and a cleaning cloth. Buy Emporio Armani EA1068 glasses online at a friendly price. Originally made in 2018, Armani 1068 are lightweight metal frames. Each pair of authentic Emporio Armani glasses ships worldwide with authenticity certificate, Emporio Armani box, case and a cleaning cloth. Buy Emporio Armani EA1066 glasses online at a friendly price. Originally made in 2018, Armani 1066 are lightweight metal frames. Each pair of authentic Emporio Armani glasses ships worldwide with authenticity certificate, Emporio Armani box, case and a cleaning cloth. Buy Emporio Armani EA3119 glasses online at a friendly price. Originally made in 2017, Armani 3119 are lightweight plastic frames. Each pair of authentic Emporio Armani glasses ships worldwide with authenticity certificate, Emporio Armani box, case and a cleaning cloth. Buy Emporio Armani EA3118F glasses online at a friendly price. Originally made in 2017, Armani 3118F are lightweight plastic frames. Each pair of authentic Emporio Armani glasses ships worldwide with authenticity certificate, Emporio Armani box, case and a cleaning cloth. Buy Emporio Armani EA3118 glasses online at a friendly price. Originally made in 2017, Armani 3118 are lightweight plastic frames. Each pair of authentic Emporio Armani glasses ships worldwide with authenticity certificate, Emporio Armani box, case and a cleaning cloth. Buy Emporio Armani EA3117 glasses online at a friendly price. Originally made in 2017, Armani 3117 are lightweight plastic frames. Each pair of authentic Emporio Armani glasses ships worldwide with authenticity certificate, Emporio Armani box, case and a cleaning cloth. Buy Emporio Armani EA3116F glasses online at a friendly price. Originally made in 2017, Armani 3116F are lightweight plastic frames. Each pair of authentic Emporio Armani glasses ships worldwide with authenticity certificate, Emporio Armani box, case and a cleaning cloth. Buy Emporio Armani EA3116 glasses online at a friendly price. Originally made in 2017, Armani 3116 are lightweight plastic frames. Each pair of authentic Emporio Armani glasses ships worldwide with authenticity certificate, Emporio Armani box, case and a cleaning cloth. Buy Emporio Armani EA3115 glasses online at a friendly price. Originally made in 2017, Armani 3115 are lightweight metal frames. Each pair of authentic Emporio Armani glasses ships worldwide with authenticity certificate, Emporio Armani box, case and a cleaning cloth. Buy Emporio Armani EA3110F glasses online at a friendly price. Originally made in 2017, Armani 3110F are lightweight plastic frames. Each pair of authentic Emporio Armani glasses ships worldwide with authenticity certificate, Emporio Armani box, case and a cleaning cloth. Buy Emporio Armani EA3110 glasses online at a friendly price. Originally made in 2017, Armani 3110 are lightweight plastic frames. Each pair of authentic Emporio Armani glasses ships worldwide with authenticity certificate, Emporio Armani box, case and a cleaning cloth. Buy Emporio Armani EA1062 glasses online at a friendly price. Originally made in 2017, Armani 1062 are lightweight metal frames. Each pair of authentic Emporio Armani glasses ships worldwide with authenticity certificate, Emporio Armani box, case and a cleaning cloth. Buy Emporio Armani EA1059 glasses online at a friendly price. Originally made in 2017, Armani 1059 are lightweight metal frames. Each pair of authentic Emporio Armani glasses ships worldwide with authenticity certificate, Emporio Armani box, case and a cleaning cloth. Buy Emporio Armani EA3122F glasses online at a friendly price. Originally made in 2017, Armani 3122F are lightweight plastic frames. Each pair of authentic Emporio Armani glasses ships worldwide with authenticity certificate, Emporio Armani box, case and a cleaning cloth. Buy Emporio Armani EA3121 glasses online at a friendly price. Originally made in 2017, Armani 3121 are lightweight plastic frames. Each pair of authentic Emporio Armani glasses ships worldwide with authenticity certificate, Emporio Armani box, case and a cleaning cloth. Buy Emporio Armani EA3120 glasses online at a friendly price. Originally made in 2017, Armani 3120 are lightweight plastic frames. Each pair of authentic Emporio Armani glasses ships worldwide with authenticity certificate, Emporio Armani box, case and a cleaning cloth. Buy Emporio Armani EA3114 glasses online at a friendly price. Originally made in 2017, Armani 3114 are lightweight plastic frames. Each pair of authentic Emporio Armani glasses ships worldwide with authenticity certificate, Emporio Armani box, case and a cleaning cloth. Buy Emporio Armani EA3112F glasses online at a friendly price. Originally made in 2017, Armani 3112F are lightweight plastic frames. Each pair of authentic Emporio Armani glasses ships worldwide with authenticity certificate, Emporio Armani box, case and a cleaning cloth. Buy Emporio Armani EA3112 glasses online at a friendly price. Originally made in 2017, Armani 3112 are lightweight plastic frames. Each pair of authentic Emporio Armani glasses ships worldwide with authenticity certificate, Emporio Armani box, case and a cleaning cloth. Buy Emporio Armani EA3108F glasses online at a friendly price. Originally made in 2017, Armani 3108F are lightweight plastic frames. Each pair of authentic Emporio Armani glasses ships worldwide with authenticity certificate, Emporio Armani box, case and a cleaning cloth. Buy Emporio Armani EA3108 glasses online at a friendly price. Originally made in 2017, Armani 3108 are lightweight plastic frames. Each pair of authentic Emporio Armani glasses ships worldwide with authenticity certificate, Emporio Armani box, case and a cleaning cloth. Buy Emporio Armani EA3106F glasses online at a friendly price. Originally made in 2017, Armani 3106F are lightweight plastic frames. Each pair of authentic Emporio Armani glasses ships worldwide with authenticity certificate, Emporio Armani box, case and a cleaning cloth. Buy Emporio Armani EA3106 glasses online at a friendly price. Originally made in 2017, Armani 3106 are lightweight plastic frames. Each pair of authentic Emporio Armani glasses ships worldwide with authenticity certificate, Emporio Armani box, case and a cleaning cloth. Buy Emporio Armani EA1061 glasses online at a friendly price. Originally made in 2017, Armani 1061 are lightweight metal frames. Each pair of authentic Emporio Armani glasses ships worldwide with authenticity certificate, Emporio Armani box, case and a cleaning cloth. Buy Emporio Armani EA3101 glasses online at a friendly price. Originally made in 2016, Armani 3101 are lightweight plastic frames. Each pair of authentic Emporio Armani glasses ships worldwide with authenticity certificate, Emporio Armani box, case and a cleaning cloth. Buy Emporio Armani EA3099 glasses online at a friendly price. Originally made in 2016, Armani 3099 are lightweight plastic frames. Each pair of authentic Emporio Armani glasses ships worldwide with authenticity certificate, Emporio Armani box, case and a cleaning cloth. Buy Emporio Armani EA3098 glasses online at a friendly price. Originally made in 2016, Armani 3098 are lightweight plastic frames. Each pair of authentic Emporio Armani glasses ships worldwide with authenticity certificate, Emporio Armani box, case and a cleaning cloth. Buy Emporio Armani EA3097 glasses online at a friendly price. Originally made in 2016, Armani 3097 are lightweight plastic frames. Each pair of authentic Emporio Armani glasses ships worldwide with authenticity certificate, Emporio Armani box, case and a cleaning cloth. Buy Emporio Armani EA1058 glasses online at a friendly price. Originally made in 2016, Armani 1058 are lightweight plastic frames. Each pair of authentic Emporio Armani glasses ships worldwide with authenticity certificate, Emporio Armani box, case and a cleaning cloth. Buy Emporio Armani EA1057 glasses online at a friendly price. Originally made in 2016, Armani 1057 are lightweight metal frames. Each pair of authentic Emporio Armani glasses ships worldwide with authenticity certificate, Emporio Armani box, case and a cleaning cloth. Buy Emporio Armani EA3091F glasses online at a friendly price. Originally made in 2016, Armani 3091F are lightweight plastic frames. Each pair of authentic Emporio Armani glasses ships worldwide with authenticity certificate, Emporio Armani box, case and a cleaning cloth. Buy Emporio Armani EA3091 glasses online at a friendly price. Originally made in 2016, Armani 3091 are lightweight plastic frames. Each pair of authentic Emporio Armani glasses ships worldwide with authenticity certificate, Emporio Armani box, case and a cleaning cloth. Buy Emporio Armani EA1052 glasses online at a friendly price. Originally made in 2016, Armani 1052 are lightweight metal frames. Each pair of authentic Emporio Armani glasses ships worldwide with authenticity certificate, Emporio Armani box, case and a cleaning cloth. Buy Emporio Armani EA3079 glasses online at a friendly price. Originally made in 2016, Armani 3079 are lightweight plastic frames. Each pair of authentic Emporio Armani glasses ships worldwide with authenticity certificate, Emporio Armani box, case and a cleaning cloth. Buy Emporio Armani EA3073F glasses online at a friendly price. Originally made in 2016, Armani 3073F are lightweight plastic frames. Each pair of authentic Emporio Armani glasses ships worldwide with authenticity certificate, Emporio Armani box, case and a cleaning cloth. Buy Emporio Armani EA3072F glasses online at a friendly price. Originally made in 2016, Armani 3072F are lightweight plastic frames. Each pair of authentic Emporio Armani glasses ships worldwide with authenticity certificate, Emporio Armani box, case and a cleaning cloth. Buy Emporio Armani EA3061F glasses online at a friendly price. Originally made in 2016, Armani 3061F are lightweight plastic frames. Each pair of authentic Emporio Armani glasses ships worldwide with authenticity certificate, Emporio Armani box, case and a cleaning cloth. Buy Emporio Armani EA1046 glasses online at a friendly price. Originally made in 2016, Armani 1046 are lightweight metal frames. Each pair of authentic Emporio Armani glasses ships worldwide with authenticity certificate, Emporio Armani box, case and a cleaning cloth. Buy Emporio Armani EA1042 glasses online at a friendly price. Originally made in 2015, Armani 1042 are lightweight metal frames. Each pair of authentic Emporio Armani glasses ships worldwide with authenticity certificate, Emporio Armani box, case and a cleaning cloth. Buy Emporio Armani EA1041 glasses online at a friendly price. Originally made in 2015, Armani 1041 are lightweight metal frames. Each pair of authentic Emporio Armani glasses ships worldwide with authenticity certificate, Emporio Armani box, case and a cleaning cloth. Buy Emporio Armani EA1036 glasses online at a friendly price. Originally made in 2015, Armani 1036 are lightweight metal frames. Each pair of authentic Emporio Armani glasses ships worldwide with authenticity certificate, Emporio Armani box, case and a cleaning cloth. Buy Emporio Armani EA3076 glasses online at a friendly price. Originally made in 2015, Armani 3076 are lightweight plastic frames. Each pair of authentic Emporio Armani glasses ships worldwide with authenticity certificate, Emporio Armani box, case and a cleaning cloth. Buy Emporio Armani EA3069 glasses online at a friendly price. Originally made in 2015, Armani 3069 are lightweight plastic frames. Each pair of authentic Emporio Armani glasses ships worldwide with authenticity certificate, Emporio Armani box, case and a cleaning cloth. Buy Emporio Armani EA3061 glasses online at a friendly price. Originally made in 2015, Armani 3061 are lightweight plastic frames. Each pair of authentic Emporio Armani glasses ships worldwide with authenticity certificate, Emporio Armani box, case and a cleaning cloth.